3 to 7-piece, male lead vocals, 2x1 hour or 3x40 minute sets. Recorded music during breaks. When it comes to authentic crepe-soled, slick-backed, bobby-sockin rock ‘n’ roll, The Firebirds are the band. Formed in 1981, this group is acknowledged as one of Europe’s finest rock ‘n’ roll bands. 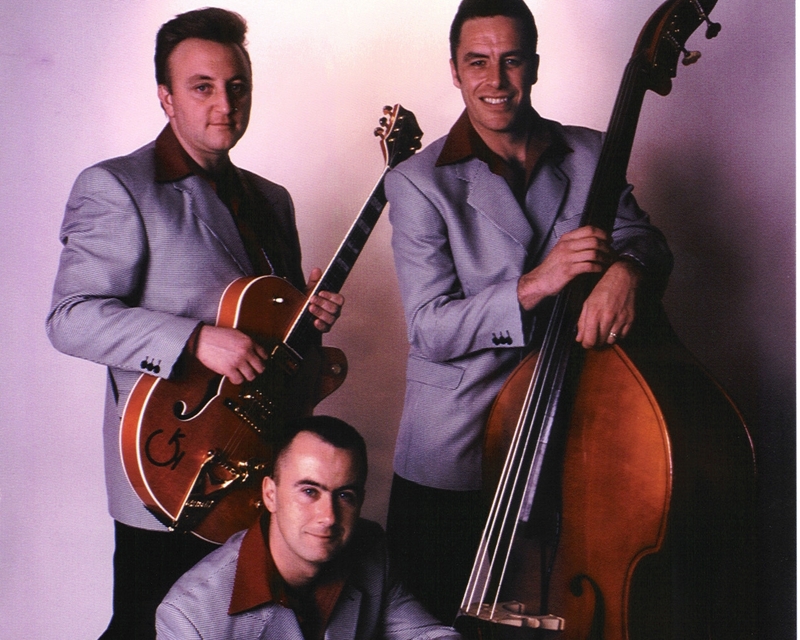 With three first class musicians/vocalists playing lead guitar, double bass and drums they cover the complete spectrum of 50s and 60s music from commercial rock ‘n’ roll songs through to rockabilly, harmonised “doo wop”, instrumentals and ballads, throwing in some of their own compositions on the way. The band’s top quality status is confirmed by the fact they have backed many of the rock ‘n’ roll legends, including American singers Jerry Lee Lewis, Charlie Feathers, Charlie Grace, Ray Campi and Sleepy La Beefe and British stars such as Marty Wilde, Lonnie Donegan and Showaddywaddy. They have toured extensively in Belgium, Germany, Holland, France and Denmark, played at the official opening of the Euro Disney Theme Park and also performed in Memphis and Las Vegas. Their CDs and videos are distributed throughout the UK, Europe, America, Russia, Japan and the Far East. The band cover a wide range of artists including Eddie Cochran, Bill Haley, Elvis Presley, Buddy Holly, Dion & The Belmonts, Jerry Lee Lewis, Little Richard, Cliff Richard, Marty Wilde, Billy Fury, Tommy Steele, Gene Vincent, Carl Perkins and Ricky Nelson. This enduring music is great for getting audiences of all ages on to the dance floor, ideal for weddings, private parties and corporate functions. The Firebirds normally play three 40-minute sets or two one-hour sets and have a professional PA system and lighting rig to highlight the band. Between the sets they can also supply (at no extra charge) 60s to 90s background music to create an evening of varied musical entertainment. Our quoted price is for a three-piece band, but The Firebirds also perform as a seven-piece big band adding tenor sax, trombone, trumpet and piano to their normal line up, and expanding their repertoire to bring in jump jive and jazz. "A fantastic band, our guests loved them and we will be looking to hire them again! Can't say enough good things about The Firebirds!!!!"